Occupations: Pilot, Body Guard, former Iron-Man, former CEO and head of Start Enterprises. History: James Rupert Rhodes first met billionaire industrialist Tony Stark while flying combat missions in Vietnam. Rhodes' helicopter had been shot down by Viet Cong rocket fire, and while trying to get the aircraft airborne again, he encountered Stark, who had just escaped from the prison camp of the Vietnamese warlord Wong Chu in a bulky prototype suit of powered armor. At that moment the Viet Cong attacked, and Stark, in his suit, helped to drive them off. Together, Rhodes and Stark made their way to a nearby enemy base where they stole another helicopter, flying it back to the American lines. After the end of the Vietnam War, Stark, who had secretly become the superhero named Iron Man, offered Rhodes a job as his personal pilot, and Rhodes soon became one of Stark's closest associates and confidants as well as Stark Industries' chief aviation officer. As a result, he had numerous adventures with his employer where his daring and skills were valuable assets. When Stark lost his company to Obadiah Stane and relapsed into alcoholism, Rhodes took over the armor and role of Iron Man in Stark's stead. However, he began to experience headaches while using the armor, and over time, his behavior began to grow more erratic and aggressive, prone to violent solutions to given problems. Rhodes's manic mental state was later revealed to be the result of his using armors whose cerebral interfaces were calibrated for Stark's brain, leaving any other long-term user disoriented and confused. When Stark was on the road to recovery, he helped Rhodes maintain the armor, but Rhodes became increasingly paranoid, believing that Stark meant to retake the armor. Rhodes went on a rampage, and Stark was forced to don a crude, prototype suit of armor he was designing as the next generation Iron Man armor to stop his friend. Rhodes gave up the Iron Man identity, and Stark went on to complete the next generation armor, defeat Stane and regain his company. Stark also subsequently designed a heavier-armed version of the Iron Man suit, the "Variable Threat Response Battle Suit" to battle the Masters of Silence, and it became known as the War Machine armor. 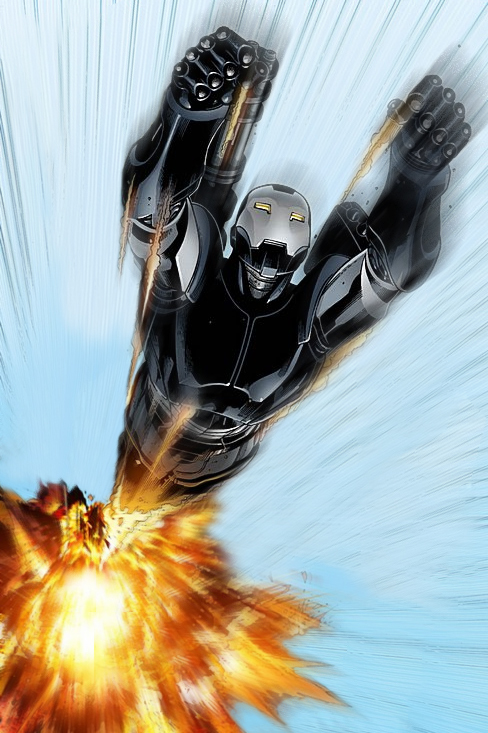 Rhodes used the War Machine armor as Iron Man when Stark faked his own death while recovering from a life-threatening illness. When Stark revealed his ruse, it damaged the friendship between the two men, and they went their separate ways. 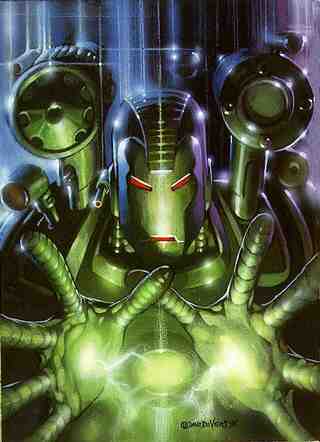 Rhodes, however, continued to use the War Machine armor in a solo superhero career, and it eventually was replaced by a symbiotic alien suit, known as the Eidolon Warwear. When Stark died during a battle with Kang the Conqueror, Rhodes rejoined Stark Enterprises (which was bought by Fujikawa Industries) to protect his old friend's legacy. To prevent Stark's armor technology from being misused, he used the abilities of his alien armor to erase all trace of Stark's designs from the Fujikawa systems, but the armor was destroyed in the process. Rhodes gave up his superhero career and started his own salvage company. Later, perhaps unsurprisingly, Stark once more returned from the dead, forming a new company, Stark Solutions and taking up the Iron Man identity once more. The two men were reconciled and Rhodes and Stark teamed up again to stop a new villain (also calling himself War Machine) who was wearing what looked like a version of the old War Machine armor, including a heavily-gunned exo-suit, but was in fact not based on Stark technology. Powers and Abilities: A notable element of the character is, unlike other superheroes, his appearance and abilities are continually in flux as Stark continually modifies and upgrades his equipment. This is most obvious with the regularly changing appearance of his armor. The War Machine armor has always been grey and black, finding that this appearance frightened criminals. War Machine's powers and abilities derive from the advanced powered armor that he wears. The armor has evolved from a bulky iron suit to a molecularly aligned matrix of crystallized iron enhanced by magnetic fields over layers of other metals like titanium, creating a shell that is pliable, yet capable of amazing resilience and protection. The suit grants him vast superhuman strength and flight capabilities, and is powered by a combination of solar converters, electrical batteries and an on-board generator that uses beta particle absorption as a fuel source. The suit is also able to convert nearby energy sources, such as heat or kinetic energy into electricity, or even drain electrical energy directly into the batteries for recharge. The suit can be completely sealed for operations in vacuum or underwater, providing its own life support, and is shielded against radiation. The on-board systems of the armor are controlled by War Machine's brain patterns, read from a cybernetic interface in his helmet. Sophisticated computers with an artificially intelligent operating system of Tony Stark's own design provide tactical information as well as constant feedback on the suit's status, using internal and external sensors. Stark has tried to put safeguards in to make sure that the systems do not actually achieve sentience, although these were once circumvented. The weapons systems of the suit have evolved over the years, but War Machine's standard offensive weapon has always been the repulsor beams that are fired from the palms of the suit. Other weapons built into various incarnations of the armor include the unibeam projector in its chest; pulse bolts that pick up kinetic energy along the way, so that they hit harder the further they have to travel; an electromagnetic pulse generator and an energy shield. He also has many conventional weapons mounted on his armor, such as a chain gun, rocket pods, energy sword, and his ultimate weapon, 8 low-radiation mini-nukes. Due to his affiliation with Stark Enterprises, War Machine has access specialized suits for space travel, deep-sea diving, stealth and other situations that have been developed by Tony Stark. Stark has modified suits like the "Hulkbuster" heavy armor, composed of add-ons to his so-called modular armor, designed to enhance its strength and durability to allow it to take on the Incredible Hulk. Stark also developed an electronics pack during the Armor Wars that, when attached to armors that use Stark technology, would burn out those components and render the suit useless. This pack was ineffective on later models, however. He is also able to remotely connect to external communications systems such as satellites, cellular phones and computers throughout the world. In addition, the armor's operating system is capable of connecting to Rhodes's nervous system, significantly increasing the armor's response time.